Critical point drying is used to reduce adhesion failure and collapse of compliant structures with small gaps during the drying process. This particular unit is intended for drying MEMS devices after the release step where capillary forces in small gaps can cause irreversible "stiction" failure of the device during drying. The process works by replacing the alcohol in which the device is bathed with liquid CO2 (at appropriately high pressures and temperatures somewhat below ambient), and then heating up and pressurizing the CO2 to pass into the supercritical phase, before returning to ambient conditions on the other side of the Liquid-Gas phase boundary, never having crossed the phase boundary and therefore never evolving a liquid-gas interface that would create high surface tension forces. 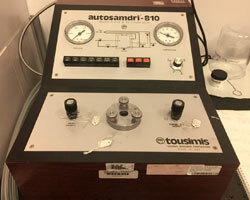 The Tousimis system is an automatic critical point dryer with a small (1.25" diameter) chamber. A chip holder that holds 5 10 mm dies is available.